One of the runner-ups in my favorite film/story genre topics is zombies. They've gotten kind of grosser and more disgusting over the years, but the character motivation is essentially the same as it always has been. Zombies just want to survive in a quest for live humans to ingest--or more precisely brains. The brain thing has been a more recent afterthought of zombie history, but it's very effective. Since some of us actually value our brains, that organ is the one we probably most want to retain. After all, losing our brains to be someone's dinner would leave us more than brain dead--we would be brainless. But come to think of it there are plenty of brainless people around already so maybe the zombies have already attacked. The term is often figuratively applied to describe a hypnotized person bereft of consciousness and self-awareness, yet ambulant and able to respond to surrounding stimuli. That description can certainly get us off the hook for a lot of things for which we might be otherwise responsible. What an excuse--"I didn't know any better cause I'm a zombie". No thinking--I could just watch mindless television shows and read dumb books and not really think about much of anything. No worries--other than perhaps the next meal, but zombies don't think and worry implies thinking about something. No opinions--no one would be upset about what I thought because I wouldn't thinking about anything. No long annoying blog posts--since I wouldn't have opinions and wouldn't be thinking, my blog posts would be short and empty. No talking--just grunts, growls, and weird guttural noises. No one would have to hear me talk about my opinions or thoughts because I wouldn't have any. No losing--the candidates I voted for would always win. I'd say there are more plusses to being a zombie, but I don't want to think about them. Maybe I'm starting to turn into a zombie already! How sublime--a life of empty-headed bliss lies ahead for me. Be prepared for a real change on this blog. For now I think I'll just stare glassy-eyed into space. Can somebody toss me a brain please? Would you like to be a zombie? Why do you think zombies are so popular? Who's your favorite zombie? You make a compelling argument, Lee. Favorite zombie? Bud from Day of the Dead. Interesting post. : ) My favorite zombie series is The Walking Dead. The new season starts in October. Sure, you don't have any worries and you don't have to do any annoying blogging, but that's not the only perk. Think about all that travel! You could just walk all over the country in search of brains. I bet you'd see some pretty cool sights when you weren't ripping people limb from limb. I love that Spirit Unlimited commercial with the zombie asking about the Lifetime Plan. But he's not alive. He's undead. And therein lies the conflict. Sorry, not into zombies, HATE, zombies. Scare the hell out of me, and cause nightmares I could live without. Human monsters scare me the most. Alex - I don't remember Bud, but of course with my brain gone I don't remember much. Susanne-- I've yet to get into The Walking Dead though now I'll be able to relate to it better. I hope the zombies win. Beer-- Slow-going perhaps, but I guess I'd have all the time in the world. Stephen -- Oh yeah, funny stuff. Keep in mind (if you still have one) that commercials may be partly responsible for turning me into a zombie. Yolanda -- Aw, don't go casting us all in the same light (or is is darkness). Some of your neighbors may be zombies and you don't even realize it yet. You have many good arguments for being a zombie. Recently, when I think Zombie, I think of that commerical (not sure what's it for) where the zombie is asking someone for help. She calls him a zombie and he says, Whoa, no need for labels," or something like that. Then his ear falls off. I love to read about zombies, but I'm not much for watching them... I got through half a scene of Walking Dead and had to turn it off! It must be so boring to be a zombie. I think they stay popular because so many people are subconsciously thinking the world is heading for doomsday. I am one of the few people on the planet not enchanted by zombies. Wouldn't want to be one and have no desire to meet (or even watch) one. For the record, I don't think a zombie would even have a blog, so the posts would go from long to none. Ha! Not a fan of zombies at all...I'm too much of a sissy for those horror films. Did you see Warm Bodies? I think I'll pass on the zombie-ism. I like thinking. Teresa -- I just watched the commercial. Funny. Morgan -- I haven't been especially impressed by Walking Dead but I guess considering its popularity it must have something going for it. Susan GK -- Or perhaps a lot of people have boring lives and they identify with boring zombies. Robin - Yeah, but someone who was already a blogger turned into a zombie they'd probably just keep blogging because that's what they do. Kind of a reflex action or something. Sharon-- Interesting. I suppose there can be many interpretations of zombieism. Scots Lass-- Don't think of being a zombie as horror. Just don't think of anything. Andrew -- Did not see Warm Bodies yet. Sometimes thinking can get us in trouble. If we don't think and express opinions then we are innocuous. Well, until we start eating people. Being a zombie is a pretty compelling statement about the state of our society. And they're darn fun too. I personally like slower zombies vs fast ones (World War Z). L.Diane -- I think a lot of us could at least use a bit of a responsibility vacation. Yvonne-- I've been feeling the same way. Southpaw-- Maybe not the most appetizing food post. And we're not supposed to think. Jay -- I definitely prefer the slow zombies. Fast zombies are so out of character for living dead. Now I've read this I can actually say that you make a really compelling argument Lee. The principles a zombie has and upholds actually are credible ones to desire for sure but at the same time I'm put off wanting to become a member of the walking dead for one reason, because then I'll be, well, dead. I've always liked zombie movies, for the same reason I like post-apocalyptic stories: they're survival stories. Hey, is that your ear on the ground there? Oh, but hey you don't really need it anyway. I'll just toss it in the trash, shall I? Yeamie -- I know what you're saying. I'm not quite ready to be dead yet. Kelly -- I like those genres for the same reason. Jagoda -- I'm glad someone had fun with this. I was beginning to think I was being taken seriously. I remember reading that normal waking consciousness reads on an EEG exactly like the hypnotized state. (Different from sleep or being high on drugs.) How do you like them apples? Well there are zom-bees. Bees infected with a parasite that put them in a zombie-like trance/state. Their stimuli is light and they fly in a daze. True story. I don't want to be a zombie. How would I get my writing and reading done if I no longer cared? This was a fun post Arlee, kind of allowed me to kick back and enjoy a fun crazy thought. Suze - I believe the original concept of zombies were living people in a hypnotic trance or under some sort of voodoo spell. Is that what you're referring to? It makes sense about the brain waves of a hypnotized person would be the same as a person in a normal wakeful state. The hypnotist's command "you are in a deep sleep" is actually incorrect. Sheena-kay -- I guess I'm just trying to find an excuse not to write. Or at least not write anything too deep. But yeah, it's all speculative fun. Humor I was hoping. Paula-- Now you are getting closer to my actual intent here. Recent events partially inspired this post. While I absolutely love a good zombie movie- they are some of my all time favorites, I can't imagine ever wanting to be one. I fear brainless people and avoid them like the plague. Incidentally, I do use zombie targets when I go shooting. Also, isn't being a zombie a lot like being stuck in purgatory? Nice analysis. I think it's an interesting commentary on how zombies represent all of us. Seeking brains not for intelligence, but just to survive. The whole day by day living seems pretty relevant. 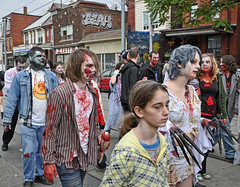 Jasmine -- I wouldn't really want to be a zombie, but I think the mentality has become an easy way out for many Americans. I do like zombie movies though. Paul -- A lot of people don't seem to want to think for themselves and sometimes get scared or outraged when someone else starts infusing ideas into their lives. Having a zombified population probably benefits the government. The staring off into space without a care in the world part does sound tempting, But a zombie diet would be tough to swallow. You don't hear about too many vegetarian zombies. This was fun Lee! Julie --That diet doesn't appeal to me either. And the more graphic the movies get the less I want to partake of the zombie diet.